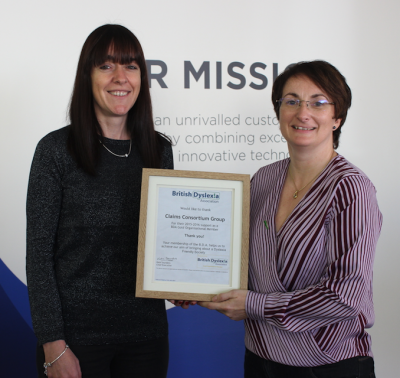 Claims Consortium Group has obtained ‘gold’ membership as an employer with the British Dyslexia Association (BDA). The Group is one of only five UK companies to secure this level of membership, which supports their policy to provide learning and development opportunities for all its 250-plus employees. Jeremy Hyams, CEO at the Group, who didn’t get to understand his own dyslexia challenges until he went into the workplace, wants his staff to have the opportunity to realise their own skill sets and maximise their full potential within the groups pioneering business. Jeremy has shared with his staff his belief that if it wasn’t for understanding his own dyslexia and then learning how to take advantage of his strengths and learning style he could not have created the business that he has today. “Within the Group we support the development of all our employees,” explains Debbie Mawer, Director of People and Culture at Claims Consortium Group. “By providing motivation, support and encouragement, individuals are equipped to overcome any challenges to fulfil both professional and personal goals. The Group has also invested in BDA training for their Learning and Development Specialist, Sonja Carr. She hopes to become a workplace assessor which will enable the Group to have on-site support to make reasonable adjustments and encourage staff to reach their true potential. According to the BDA, 10% of the population are dyslexic, with 4% experiencing a severe form of the condition. The association states the biggest problem in treating the symptoms is recognising and understanding the condition in the first place.